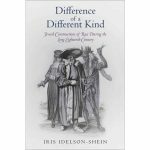 Dr. Iris Idelson-Shein teaches history at Tel Aviv University and is currently a fellow at Penn’s Herbert D. Katz Center for Advanced Judaic Studies. She studies early modern and modern Jewish thought and published on early modern views of gender and ethnicity. She will discuss the radical transformation in how 18th-century Europeans defined identity. The shift from a worldview dominated by scripture and faith, to one dominated by science demanded new explanations for the differences among people. She will explore how Jewish writers tackled these changes while trying to define their own position in the new paradigm. Dr. Idelson-Shein’s presentation at SJU is the last of a three-part series, “Between Cross and Crescent: Jews in the Christian and Muslim Worlds,” co-sponsored by the Herbert D. Katz Center for Advanced Judaic Studies at the University of Pennsylvania, Beth Am Israel, and Main Line Reform Temple-Beth Elohim.